Collections exposed. A way to promote the collections available at specialized libraries is to aggregate them into the flow of a central provider. These days we can see an example of this strategy with the launch of the new European Library, a result of an innovative partnership between the Conference of European National Librarians (CENL) and three other leading library organisations: LIBER, CERL and the Europeana Foundation. 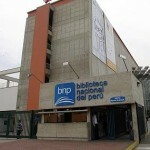 Ramon Mujica was recently confirmed again as Head of the Peru’s National Library by the incoming President Ollanta Humala. Mujica, who has been in office since September 2010, was actively exposed in media because of his complaints about some valuable books which had been taken away from the library.